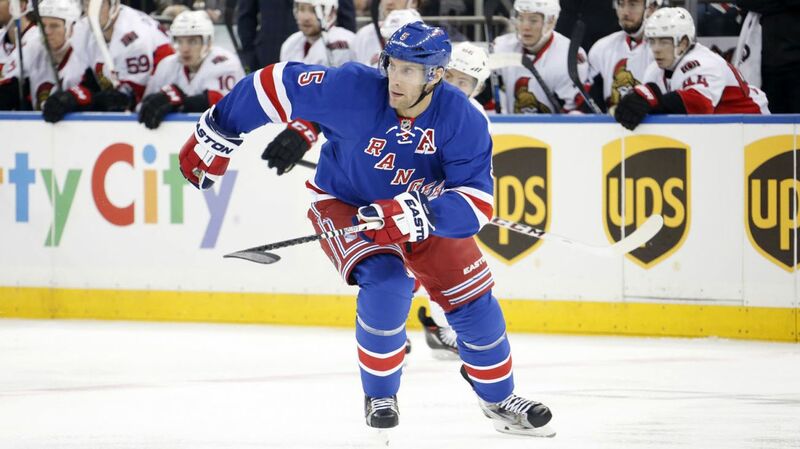 Rangers close out road trip against surging Panthers; Girardi playing injured? After many ups and downs to the season during the 2015 portion of this season, the Rangers (21-13-4) will look to start 2016 out on the right foot when they take on the Florida Panthers (21-12-4), a youthful team with ambitions of a playoff berth. This is the second of three matchups against the Cats this year, and the last one down in Sunrise, Florida. The Rangers skated away with a 5-4 victory on November 21st thanks to Rick Nash’s monster night. Nash scored his second career hat trick in the game, including the game winner, as well as registering 10 shots on goal. Mats Zuccarello had a goal and two assists, and Henrik Lundqvist made 39 saves for the win. The Panthers enjoyed one of the best months in franchise history, going 11-3-0 in the month of December, including winning their last seven games. A win tonight would set a new franchise record. Because of their success, and their place in the Atlantic Division, the BB&T Center has been packed as of late. With the Rangers in town, you can expect a packed and raucous arena tonight. With some great drafts, trades and offseason signings, the Panthers have turned around a franchise that secured just 66 points a year ago. Now, they’re legitimate contenders, and they sit one point behind the Canadiens with three games in hand. Florida GM Dave Tallon traded for the now 43 year old Jaromir Jagr last season, and it has been an invaluable addition to the team. Not only is he leading the team in scoring (11-15-26) and providing an impact on offense, Jagr has been an excellent mentor to the team’s young forwards. In fact, his line has been one of the best in the NHL lately. Aleksander Barkov is a budding young superstar, and he has been scoring in bunches lately, with 10 points (5-5-10) in his last seven games, including five points in the last two matches. Jonathan Huberdeau is showing flashes of his Calder Trophy self again, leading the team in assists (21) and sitting in second on the team in points (25). With Jagr on the right wing, this is a dangerous trio. Last season, Jimmy Hayes scored 19 goals and 35 points in his best season in the NHL. So the Panthers shipped him off to Boston for Reilly Smith. And while Hayes has been sporadic in scoring, Smith has been a consistent contributor with 11 goals and 20 points. His linemates Vincent Trocheck (10-12-22) and Jussi Jokinen (7-16-23) are also scoring threats. Aaron Ekblad is developing into a goal scorer. The second year player is coming off of a Calder Trophy winning season, starting this year with nine goals and 18 points. Expect him to play 20+ minutes and man the point on the power play. Roberto Luongo will be in net for the Panthers, and the 36 year old goalie is showing no signs of slowing down. Luongo has won 16 games this year, and has a solid .926 save percentage and a 2.16 GAA. He’s still got a quick glove and is a big reason for Florida’s success. Henrik Lundqvist will start for the Rangers following a strong 20 save performance in the Rangers win against the Lightning. Hopefully it’s a sign of a turnaround for Lundqvist, who is 3-5-0 in his last nine games and has been pulled in four of them. In his career against Florida, Lundqvist is 21-9-1 with a 1.87 GAA and a .936 save percentage with five shutouts. Dan Girardi was the only Rangers to miss practice yesterday after his knee started to swell again, a problem that caused him to miss four games earlier this year. He has a small crack in his right kneecap, and what I don’t understand is why he is playing. I get the “warrior” mentality and not wanting to miss starts, but if Girardi is injured, rest him and let him heal. Playing him isn’t going to help him, and it certainly won’t help the team. Plus, McIlrath deserves to play. Dan Boyle stayed hot with a goal against the Lightning, his fifth in the last 10 games. Boyle also picked up an assist on Mats Zuccarello’s goal, giving him a total of nine points in the last 10 games. He’s rightfully playing 19+ minutes a night and will look to contribute again tonight. JT Miller made an excellent drop pass to Zuccarello on his goal, and picked up another road point, giving him at least a point in five consecutive road games. He leads the Rangers in points (14), tied for the team lead in assists (8) and is tied for second in goals (6) on the road this season. He’s been getting top six minutes too, and I have a feeling he’ll have a big game tonight. The Rangers and the Panthers will face off at the BB&T Center at 7 PM. The game will be broadcasted on MSG Network. Posted on January 2, 2016, in Game Previews and tagged Aaron Ekblad, Alain Vigneault, Antti Raanta, Barkov, Chris Kreider, Dan Boyle, Dan Girardi, Derick Brassard, Derick Stepan, Dominic Moore, Dylan McIlrath, Ekblad, Emerson Etem, Florida Panthers, Henrik Lundqvist, Huberdeau, Jaromir Jagr, Jesper Fast, JT Miller, Keith Yandle, Kevin Hayes, Kevin Klein, Madison Square Garden, Marc Staal, Mats Zuccarello, MSG, New York Rangers, New York Rangers blog, NHL All Star captains, NYR, Oscar Lindberg, Rangers, Rangers blog, Rick Nash, Ryan McDonagh, Viktor Stalberg. Bookmark the permalink. 1 Comment. Girardi is bad enough when healthy, injured he is worse. Hopefully they are only playing him to see if someone is foolish enough to take him back ft their hands. McIlrath is playing far better than Griardi has for a year and a half, but AV keeps watching everyone blow right by him.